A compact red–brick structure, of c.1891, situated next to the city walls and of tremendous historic and architectural interest as it remains the first fire station for the City of Londonderry and only surviving late 19th Century station in Northern Ireland. 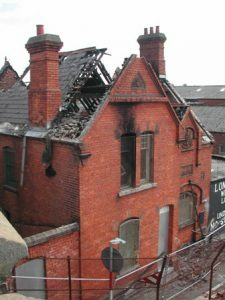 The B2 listed building suffered previous problems of vandalism and was badly damaged by fire in June 2006 and was very close to demolition due to serious structural problems. 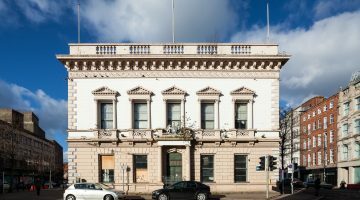 But in 2007 Derry City Council seen the potential the historic building still offered and decided to include it in their regeneration aims and Economic Development plan for the area. 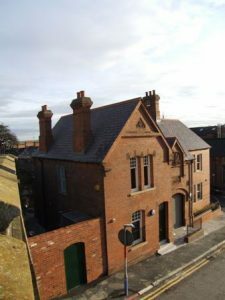 Hall Black Douglas architects were involved with the complete restoration of the 19th century building as well as a new two–storey extension. Another element of the project involved the installation of an art–piece on the front wall of the building’s new extension. The idea for this arose from discussions with the local community, reflecting the history and culture of the local area. The building now houses high quality office accommodation equipped with modern amenities/specifications including telecommunications infrastructure, air conditioning and full disabled access throughout. Approximately £1.8m funding obtained from: NIEA Listed Building Grant Aid; Derry City Council Economic Development Department; 50% through the European Union’s “Building Sustainable Prosperity” programme administered by Department of Enterprise Trade & Investment (DETI).